A Vistosi purple / amethyst mushroom shaped table lamp, circa 1960s Italy. Attributed to designer Michael Red. An almost black amethyst glass mushroom dome with fused white translucent stem. When the light is off the amethyst glass appears to be black but shows it's color when the lamp is turned on. Blown Murano glass. 9" diameter chrome plated base. In-line on/off switch. Takes one standard base light bulb. Partial label intact. Murano, Made in Italy. 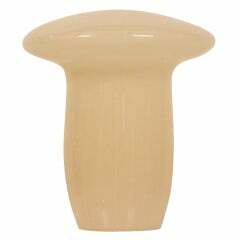 Would be great as a desk lamp or sculptural statement! 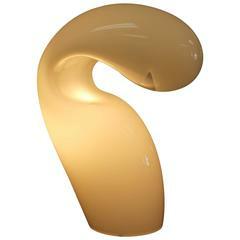 A fabulous table lamp in a handblown mushroom form comprising pale brown Murano glass with thin vertical caning. By Vistosi. Italian, circa 1980. 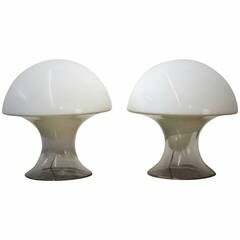 Pair of Vistosi Murano glass mushroom table lamps. Vintage Murano Italian Vistosi mushroom glass table lamp. The bottom edge rim has a small knick which is pictured.